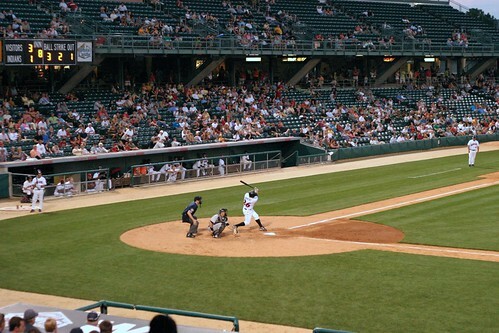 The Indianapolis Indians start the 2013 season at home on Thursday, April 4 against the Columbus Clippers at 7:00 pm. Downtown Indianapolis is also kicking off Opening Day with their own celebration. They’re urging everyone to visit the Sun King Brewery at 4:00 pm, and Bike to the Ballpark with Indianapolis Mayor Greg Ballard, INDYCOG, and NUVO. Sun King says Mayor Ballard will “lead the ride” to the ballpark, but I think if you pushed it, you could probably beat him there. Sun King will be serving up their Victory Lager, their own custom Indianapolis Indians beer, and food trucks Nacho Mama and Groovy Guys Fries will be on hand to get you in the baseball food mood. But save room for some hot dogs. You can’t have a baseball game without hot dogs. Once you’re at the game, the Indians will be giving away a schedule magnet and will have a free fireworks display after the game.